The spring season and lush spring grass bring with them cattle health risks. One of those risks is grass tetany, a metabolic disorder caused by low magnesium levels in the blood. It can cause symptoms such as loss of muscle control, irritability and ultimately coma and death in cattle. Low forage magnesium levels can be a cause of grass tetany, but high potassium and nitrogen (protein) levels in spring grasses will also impair magnesium availability to the animal. Using forage tests to identify the risk of grass tetany can be a challenge because spring pastures are rapidly changing. Cattle are at their greatest risk of grass tetany in spring when conditions typically include cloudy skies, cool soils, and lush quickly-growing cool-season grasses. Risk can increase with highly fertilized, permanent cool-season pastures or annual seeded grasses like wheat or ryegrass. Older and/or lactating cows are at higher risk than young cows. Luckily, grass tetany is preventable, and you can implement strategies to help manage your risk. 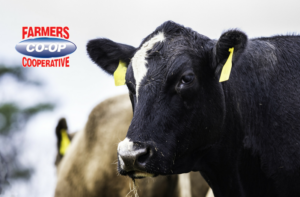 Feeding your cattle magnesium supplements, like Wind & Rain® Storm® Hi-Mag mineral, can help address magnesium deficiencies associated with lush spring grass. Offer mineral two to three weeks before cattle are first exposed to lush grass to achieve consistent intake before the time of highest risk. Continue feeding for 60 days after the first sign of grass growth. Another strategy to manage risk includes grazing less susceptible young cows on the highest risk pastures and holding older lactating cows off pasture until grasses are four to six inches tall. By the time cattle have symptoms of grass tetany, it can be too late to save them. Prevention is the best strategy. Identify your risk level now and create a plan to manage it. Talk to your local Farmers Coop to learn more about Wind and Rain Storm Hi-Mag mineral. This entry was posted on Friday, March 30th, 2018 at 3:20 pm	and is filed under Cattle, News & Updates. You can follow any responses to this entry through the RSS 2.0 feed. Both comments and pings are currently closed.